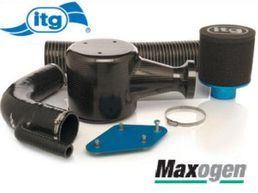 ITG Maxogen performance induction kits are race and rolling road proven to over the ultimate bolt on upgrade for track and race cars. Vulcan Racing are pleased to offer induction kits from ITG as we use on all out team built cars. A worth while investment in the ethos of offer club racers value as by fitting the best product in the market for BHP gains specifically designed for each car. 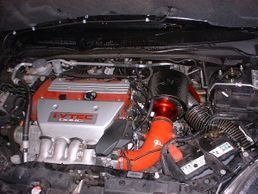 In performance terms one size does not fit all with induction kits. Maxogen airflow systems are revolutionary kits that enable cold, dense air to reach the fuel metering unit more efficiently. These remarkable units candeliver as much as 9% more effective peak power at the wheels, and in some cases at 500rpm less revs in doing so. Over the next few pages you will see that itg are able to supply fully enclosed air intake systems for some of todays more popular cars. This range is increasing on a regular basis so please get in contact with us if an application that you are looking for is not mentioned. ITG fully road test all prototypes to prove their durability and performance, and each kit is tested on the rolling road to fully enhance it’s capabilities for that particular car. This means we are able to offer power and torque graphs for each kit we supply. ITG induction Kit’s are typically constructed from a light weight carbon fibre to the highest possible standard. In some cases there is an aluminium option available which offers the same patented design at a more affordable price. Each silicone hose is designed and made for that specific application and the kits come complete with all the stainless fittings required and a full comprehensive set of fitting instructions. How does the Maxogen system work? Following years of experience designing induction systems for both rally and touring cars at world championship level, itg are now making available 11 purpose designed air boxes to form the core of a super efficient air induction system for any car. These optimised carbon fibre housings use our renowned Maxogen range of air filters in varying sizes. So, depending on the space available when the standard air box has been removed, one of these air boxes will fit most most modern road cars creating a better air flow, and providing increased performance. 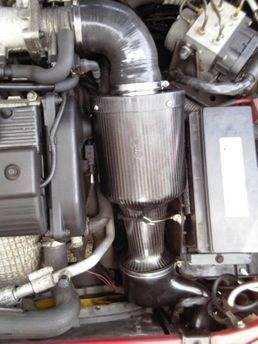 The carbon fibre housing features a radiused induction trumpet feeding from a large diameter primary inlet ducting arranged to collect cool external air. The trumpet design recovers air pressure from air velocity, filling a plenum volume around the large surface area of the MAXOGEN filter. 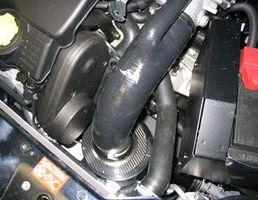 The radiused outlet of the Maxogen filter (above) connects to a high quality secondary duct to feed clean, high pressure, cool air to the engine. The complete system is amazingly light, typically weighing only 800 grammes, and yet it can handle air up to and in some cases over 500bhp! Please view our webstore for details or email peter@vulcanracing.co.uk to discuss if your kit is not listed. © 2019 Vulcan Racing - Offering Value In Motorsport Since 2010 . All Rights Reserved.